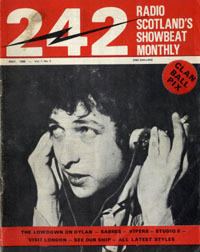 Radio Scotland 242 published their own monthly magazine in 1966 and 1967. A few issues are reproduced below, but there are many missing issues. After scannning three further issues in early 2016, the time had come to try and tidy up this page a little. Let's hope it is satisfactory. 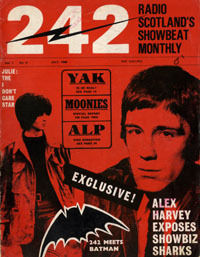 A scanned version of Issue 2 via the Pirate Hall Of Fame. The inside pages are scanned as black and white, but still very much readable. From the collection of Brendan. 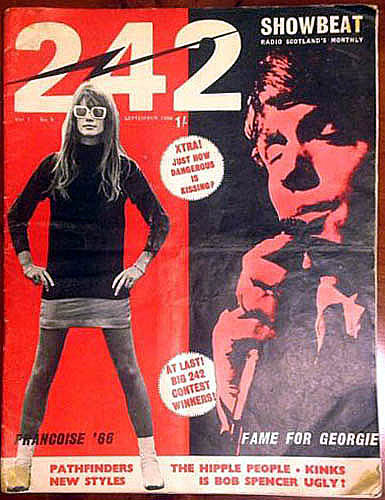 Apologies for the missing 242 banner on the original. Both original scan and patched up front page are included. From the collection of Brendan. An alternative pdf is available here, using scans made by the pirate hall of fame. From the collection of Brendan. I rescanned this issue when I could so that the PDF is a double page spread all the way through. The original file was scanned from Richard's collection. This was scanned from Richard's collection. 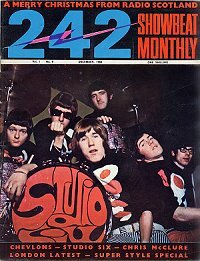 An unidentified date (due to poor scan) of an issue I was outbid on in ebay at one stage. 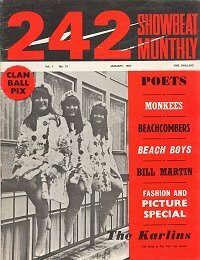 The aim here of course is to create a complete archive, so one day this issue may be reproduced complete. 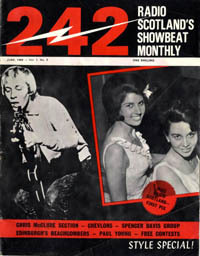 The Radio Scotland 242 showbeat magazines on this page have come from various sources. 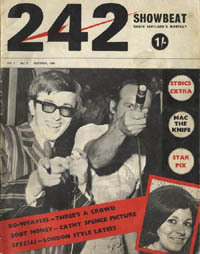 Issues 3 and 7 from our own dx archive collection. issues 9 and 10 from Richard Crichton of Glenrothes. Issues 4, 8 and 9 from Brendan Hughs via Alex Jenkins. So in January 2016, we are up to only 7 complete copies in total. There are a number of pages containing articles spread across two pages, and therefore I have left the scans as double page spreads. File size is large to preserve quality. It is such a shame that there are collectors out there holding out on other issues. They just don't seem to come forward and offer to share, by loaning or scanning themselves. Additions are welcome of course to try and complete the set. The quality I think is best with the large Epson A3 workhorse scanner that I have, and therefore I would prefer a loan for a few days, to make a full colour 300dpi scan of these items. 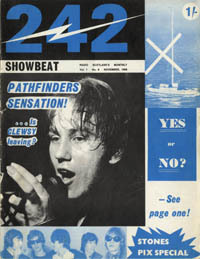 The Radio Scotland 242 SHOWBEAT magazines are very collectable these days. I turned down an offer of some, unsure of how many, in the 1980's or early 90's as I thought the price a bit steep at fifty quid. These days you may pay that for one if you are not careful!! So obviously kicking myself now of course. I found number 7 (October 1966) on ebay in October 2013, and have reproduced it here. That was fifteen quid plus postage!! In Feb or March 2014 number 3 started with a buy it now of 85 quid, reducing to 55, and finally selling to me for 40!! These come up on ebay very very rarely, and really are like the proverbial hen's teeth.